PowerPack of DVD to iPod Converter plus DVD to PSP Converter includes 2 products: dvdXsoft DVD to iPod Converter, and dvdXsoft DVD to PSP Converter dvdXsoft DVD to iPod Converter converts DVD to iPod Video! dvdXsoft DVD to PSP Converter converts DVD to PSP Video! dvdXsoft DVD to iPod Converter : dvdXsoft DVD to iPod Converter features the highest DVD converting speed, the best output video quality, and fully tested on hundreds of different DVD-ROMs and DVD Movie discs . That makes it qualified for strict compatibility standards. According to our testing, dvdXsoft DVD to iPod Converter runs very smoothly on all tested DVD-ROMs including the worst ones and the best ones. And dvdXsoft DVD to iPod Converter extracts perfect video from hundreds of DVD Movie discs from the most popular movies to those rarely known to most people. 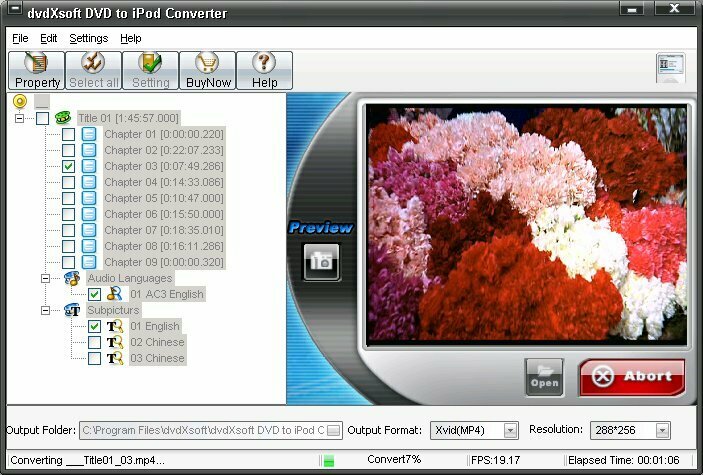 dvdXsoft DVD to iPod Converter enables you to choose different video options including MP4 video codec Xvid and H264, a rich list of different resolutions, video bitrates, video frame rates, audio bitrates, audio frequency, etc. Easy to use and fast! DVD to PSP: dvdXsoft DVD to PSP Converter is a DVD ripper which can rip DVD to MP4 for Sony PSP Video by the 2 formats supported: H264 and Xvid. dvdXsoft DVD to PSP Converter XP is the best DVD Movies to PSP Video Converter. It has easy-to-use interface, and support the fastest ripping speed with the excellent output Video and Audio quality. Now only with a few clicks you can share your favority DVD on PSP anytime, anywhere and with anybody. Free to try before buy! Features Include as followings: 1. Easy-to-use user-friendly interface. 2. Preview function when converting. 3. Capture Image from DVD. 4. Optimize CPU for better ripping. 5. Read DVD Files from DVD ROM Automatically. 6. Expert Options for Settings. 7. Excellent image and sound quality. 8. Support Converting Pause function. 9. DVD Full Play Function supported. 10. Directly support PSP.